In these "urgently relevant essays,"* the National Book Award–winning author of Between the World and Me "reflects on race, Barack Obama's presidency and its jarring aftermath"*—including the election of Donald Trump. "We were eight years in power" was the lament of Reconstruction-era black politicians as the American experiment in multiracial democracy ended with the return of white supremacist rule in the South. 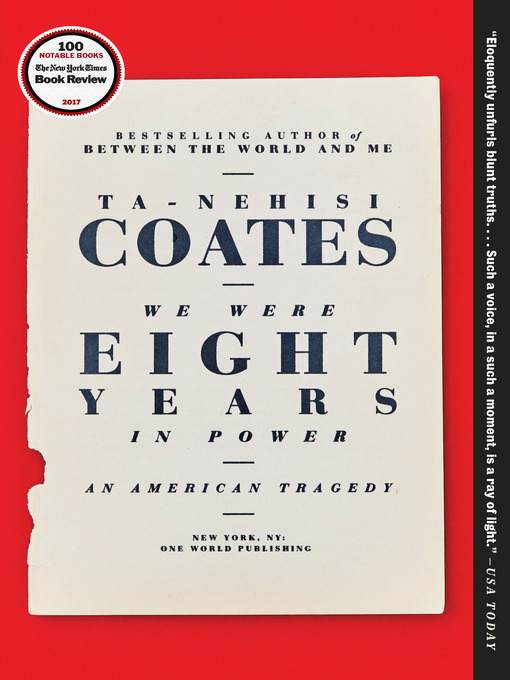 In this sweeping collection of new and selected essays, Ta-Nehisi Coates explores the tragic echoes of that history in our own time: the unprecedented election of a black president followed by a vicious backlash that fueled the election of the man Coates argues is America's "first white president." But the story of these present-day eight years is not just about presidential politics. This book also examines the new voices, ideas, and movements for justice that emerged over this period—and the effects of the persistent, haunting shadow of our nation's old and unreconciled history. Coates powerfully examines the events of the Obama era from his intimate and revealing perspective—the point of view of a young writer who begins the journey in an unemployment office in Harlem and ends it in the Oval Office, interviewing a president. We Were Eight Years in Power features Coates's iconic essays first published in The Atlantic, including "Fear of a Black President," "The Case for Reparations," and "The Black Family in the Age of Mass Incarceration," along with eight fresh essays that revisit each year of the Obama administration through Coates's own experiences, observations, and intellectual development, capped by a bracingly original assessment of the election that fully illuminated the tragedy of the Obama era. We Were Eight Years in Power is a vital account of modern America, from one of the definitive voices of this historic moment.